Scottish tattoos are have been a part of the culture since before 1600. Unlike with Eastern cultural ink such as Chinese tattoos, Scots marked mainly for purposes of recognition on the battlefield, and not for decorative or celebratory reasons. Each of these 13 regions has its own crest as well as its own individual plaid. Authentic Scottish tattoos will generally incorporate both of these and family name tattoos that includes a coat of arms will often also include the plaid of family's region. Many modern Scottish and Irish Tattoos are based in firefighter culture. Many of the uniformed men and women who serve as firefighters, especially in the New England area of the United States, come from a strong Scottish or irish family background. Many of these people are second, third or even fourth generation firefighters in their neighborhoods or regions. With such a strong familial tie to the uniform, the natural next step for many is to get a tattoo that tells the story of this family history. These types of Scottish Tattoos honor a brother, father or friend who died while serving the people of their community. These will generally have a name, birth and death dates and a symbol such as a Ladder number, a firefighter's hat and of course, fire. Many firefighters will wait for retirement or another major milestone in their career to get a tattoo. These will state years of service and perhaps the name or names of those who gave their lives around the carrier of the tattoo. Symbols such as fire, bombardier helmet and others may be worked into the piece. Scotland has a long and torrential military history seasoned with hundreds of tales about epic heroes and clans that saved the Isle from the hands of the mighty and brutal English. It is with pride in this history and a zeal to maintain the kind of strength it takes to keep from buckling under the pressures of wealthier countries trying to call the shots for them that shapes these pieces. 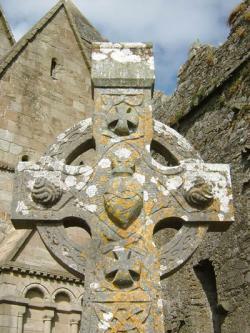 The Celtic Nations are widely known to be Ireland, Wales and Scotland. Other lesser known Celtic nations form centuries past are now the regions of Northern Spain known as Asturias and Xixon. Celtic tattoos are part of an ancient family of artwork that probably most quintessentially illustrates the history and emotion of these regions. Many people have Celtic Tattoo bands and designs; you will want to make sure that the design that you choose has a special significance for you - try not to pick something from a catalog or from the wall. 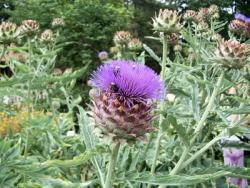 The thistle is a national symbol of Scotland.